In the wild, meerkats live in very dry regions of southern Africa, including Botswana, Namibia and South Africa. They are a part of the mongoose family and can live in family groups (called ‘Mobs’) as large as 30 members. Meerkats are omnivores, meaning they like to eat meat, vegetables and insects, like termites, butterflies, scorpions, rodents and reptiles. We have 5 gorgeous meerkats; Chiku, Stephen, Arthur, Rex and Titch. Chiku, the only female in the mob, is very much in charge. She is the most adventurous and brave of all our meerkats. 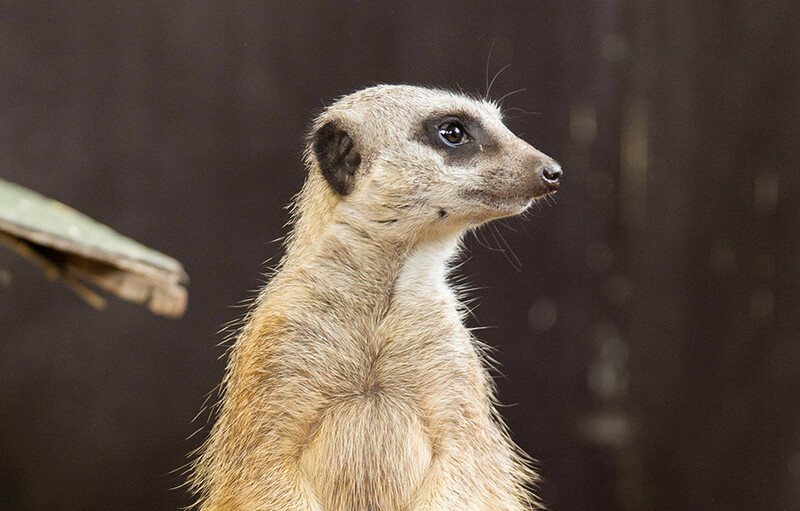 You will often see one of the meerkats on ‘sentry duty’, standing upright and looking around. Each of them will take turns to do this, and will warn the others if the see or hear any danger. Our mob enjoy eating fruit, vegetables, mice and chicken, but their favourite meal is a dish of meal worms! Fancy meeting the meerkats up close? Click here to find out more!